I am so excited! 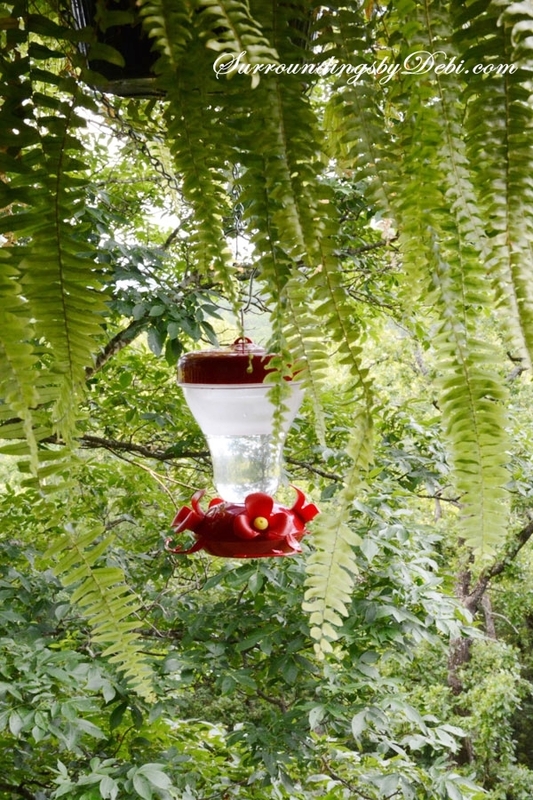 The weather has finally gotten warm enough to put out my hummingbird feeders! I mixed up my feeder solution. It is a very difficult solution ….. one cup of sugar to 4 cups of water. True – that’s all I use. So simple! I placed the feeders, and within 5 minutes I had hummingbirds at my feeders! And they have been there every day since. So of course, my favorite thing this week is hummingbirds. I absolutely love these little birds. I have feeders that hang right outside of my office window and I have the pleasure of watching them all day long. I created a simple hanger for my flower baskets for the feeders that hang on the back deck. Check them out HERE. These worked out beautifully and the hanging plants attracted the hummingbirds. I look forward to having the little guests all summer long. Now let’s get started! I can hardly wait to see the wonderful inspiration this week on our Thursday Favorite Things Blog Hop! Get ready to inspire and be inspired! 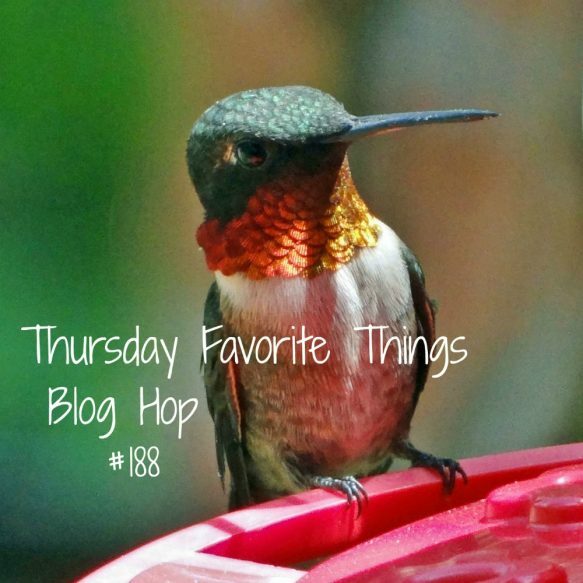 Welcome to Thursday Favorite Things Blog Hop 188! Welcome to the Thursday Favorite Things Blog Hop 188! You can link your favorite post of the week. Or write a post about your favorite things and share it with old and new followers. This hop is hosted and posted on 6 different blogs! Please follow ALL of your hostesses. Your link will appear on the blogs of Katherines Corner, Over 50 Feeling 40, Vintage Mamas Cottage, All That’s Jas, What Erika Wears and Surroundings by Debi. • Please link to your post and not to your blog home page.Yes you can link giveaways (they are everyone’s favorite thing). ♥ Optional- Link back on your post and/or Grab the hop button . Please leave comments when you visit, let them know you are visiting from the Thursday Favorite Things Blog Hop . I invite you to add your giveaways to Katherines Giveaways Page too! Those are wonderful close ups of the hummers. 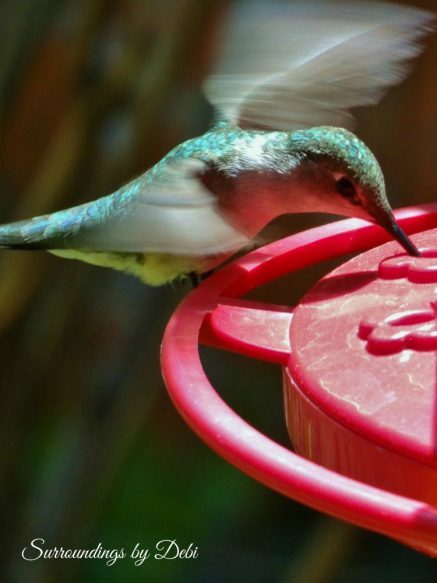 We have multiple feeders in our yard and tons of hummers all summer and even winter with our Anna’s. 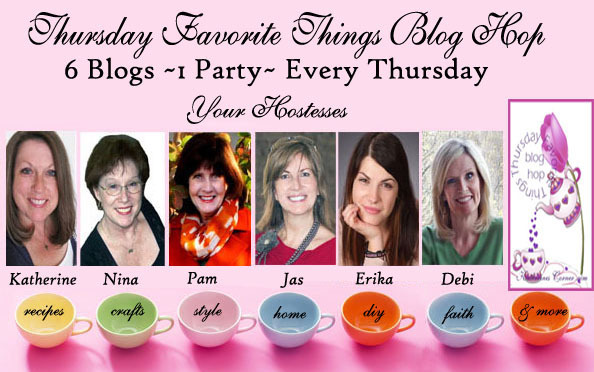 Thanks for cohostessing this great blog party. Amazing hummingbird photos! Thanks for hosting! Have a wonderful weekend! How beautiful! I have never done a bird feeder before! What a lovely idea. We have a big tree, so plenty of birds around, but a feeder would be awesome. Thanks for the idea! I’m envious. I put out a bird feeder last week, and haven’t seen any birds at it. I know they are visiting, but I haven’t caught them in the act. I’m surrounded by birds, so I was really expecting more activity.